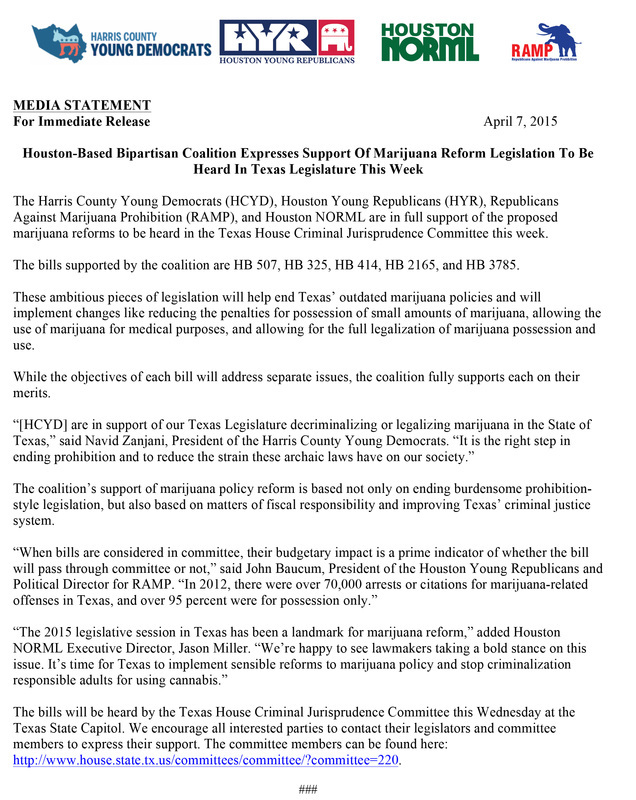 The Harris County Young Democrats (HCYD), Houston Young Republicans (HYR), Republicans Against Marijuana Prohibition (RAMP), and Houston NORML are in full support of the proposed marijuana reforms to be heard in the Texas House Criminal Jurisprudence Committee this week. The bills supported by the coalition are HB 507, HB 325, HB 414, HB 2165, and HB 3785. These ambitious pieces of legislation will help end Texas’ outdated marijuana policies and will implement changes like reducing the penalties for possession of small amounts of marijuana, allowing the use of marijuana for medical purposes, and allowing for the full legalization of marijuana possession and use. While the objectives of each bill will address separate issues, the coalition fully supports each on their merits. The coalition’s support of marijuana policy reform is based not only on ending burdensome prohibition-style legislation, but also based on matters of fiscal responsibility and improving Texas’ criminal justice system. The bills will be heard by the Texas House Criminal Jurisprudence Committee this Wednesday at the Texas State Capitol. We encourage all interested parties to contact their legislators and committee members to express their support. The committee members can be found here: http://www.house.state.tx.us/committees/committee/?committee=220.